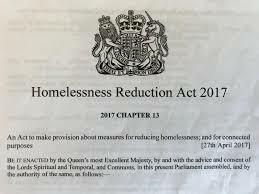 A year ago the Homeless Reduction Act was passed into law and councils and other statutory bodies throughout the land were tasked with preparing to implement the Act which is meant to be about doing what the Act’s title says – reduce homelessness. In a few days they are due to begin their implementation. The question is begged: what differences can we expect, especially in the light that in that period homelessness has been on the increase (the conservative rough sleeper estimate for Southend, November 2016 was just over 40 and a year later it was just over 70). It is not a question I can answer fully satisfactorily and, having read summary versions of what the Act sets out to do, I am not overly optimistic it will make a radical difference but am hopeful it will make some difference. Our own Council has been preparing and have been candid regarding intentions. Its recent opening of an emergency night shelter during the snowy weather is evidence at least of good will, and there are many other such examples that might be cited. As I understand it, the emphasis is on preventing people from becoming homeless in the first place and for the most part does not oblige them to find suitable accommodation for them who are homeless, which in many ways lies at the heart of the matter. My intention is neither to let the Council off the hook, nor to have a go that they are not doing enough. There are plenty of folk who will do the latter and I recognise there is a place for campaigning. My own mantra is to support the folk working at the coal face to accommodate and support the homeless and work with the Council and other statutory agencies to do the same. As for the government, they did support the passing of the Act, which began life as a Private Members Bill and one might have expected it to suffer the same fate of many other such Bills, and they have provided some funding (although arguably too little). When it comes to other major causes of homelessness: the lack of suitable, affordable accommodation, the lack of support services e.g. mental health and the collateral damage resulting from welfare reform and austerity cuts, some may argue it has done too little and others may argue the lot before them also did not do enough and through bad policies etc. sowed the seeds whereby the housing crisis we now see has occurred. My purpose of writing is not so much to politicize, but rather to point out a window of opportunity to deal with the crisis in our midst and the fact that just over a week ago 20 rough sleepers sleeping at the Church Winter Night Shelters I was involved with had to go back to sleeping on the streets is a crisis although this was partly alleviated by a new shelter: “Off the Streets”. One thing the Act does is to impose statutory obligations on Councils to become more proactive when it comes to preventing homelessness. How meticulous Councils will be doing this remains to be seen and the temptation to do the bare minimum and not address the heart of the problem will always be there. But it is a start and one thing I have learned about Councils especially as in recent years as their funding has reduced, they tend to do what they need to do (by law) and not do what they don’t need to do even if there are powerful moral arguments why they should – but I live in hope and welcome the legal impetus provided by the Act to reduce homelessness, despite many questions being begged and the enormity of the task. One of the wonderful things I have learned in my years as a homeless activist is the number of people who freely give up their time and energy to help the homeless in a variety of ways. The fact that Southend now has soup kitchens covering 6 of the 7 nights in the week is evidence of this. The fact that a new shelter started up as soon as the church shelters ceased is more evidence and there have been several, many who I know, who have contributed to making the project a success. A week in and the shelter continues to operate, but the strains are showing and the question is begged how much longer the operation can be sustained. It is why the Council and those involved in helping the homeless should be working on a more sustainable model to take people off the streets, to cover all the year.